"width and legroom were quite good"
✅ Verified Review | Flew ANA's Boeing 787. Seat width and legroom were quite good. Felt that it was very spacious. The distance of the IFE system to my face was good. Didn't feel cramped. However, the seat recline was bad. It couldn't seem to recline. What worse is that it's a red-eye flight back to Kuala Lumpur. By the way, was surprised to see a USB port below my screen because I thought there wouldn't be a USB port there! Seat storage was quite limited. Access to my seat by the window was normal. 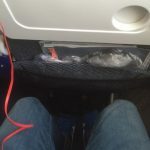 "34 inch pitch is brilliant"
✅ Verified Review | Having now done 4 flights with ANA from Sydney to Europe, the economy seat configuration basically seems to be 34” if you’re on a Boeing 787-9 and 31” on a Boeing 787-8. The 787-9 is missing a window around row 33/34 (or seat 38 in the 40-row version), but actually, when both seats are reclined, everybody gets a bit of window. I travelled in the exit row window, 28A, and the same applies — you see a little when reclined. The escape chute was not too “bothersome” however the general wall curvature around that area makes the A/B seats even squashier than usual laterally and I wouldn’t choose it again. 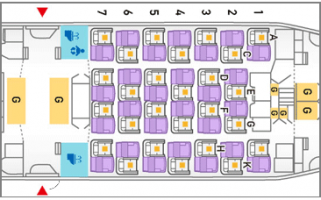 That’s the real pity about these planes: instead of 8 across, most airlines have crammed 9, making the 787 synonymous with extremely narrow seats. The 34 inch pitch is brilliant though (hence my rating) — if you can be certain you’ll be flying in a 787-9; my leg HND—CDG which was scheduled as a Boeing 787-9 when I bought it suddenly got a Boeing 787-8 substituted and legroom was unbearable as soon as you reclined your seat. If I was reviewing that flight it'd be 5/10. ✅ Verified Review | Travelled from Sapporo to Tokyo (Narita). Was a really short flight, but service is outstanding! Cabin crew walked around to hand out blankets and sweets before take off. No meal service though. But drinks and soup were available! Even in a short flight, headsets were still given for us to watch the overhead flight entertainment system. Seat were comfy enough for the whole ride and had a really pleasant flight though communication with the cabin crew was a little hard. "seat itself is quite roomy"
I am not a tall person (5'6) so legroom was never a problem for me. However, I was seated with a guy who is probably about 6'1 and his knees were still not touching the back seat in front of him. The seat itself is quite roomy, clean and comfortable. The headrest and footrest are a bonus feature that makes it your flight bearable. In-seat power (USB and actual power outlet) are available. Flew ANA from Delhi to Tokto Narita on a Boeing 767 aircraft. The flight was an overnight 8 hour flight and I was concerned about my night's sleep, which is essential to me. While I tried my best to grab an emergency exit seat, but they were all taken and ended up with an aisle seat. 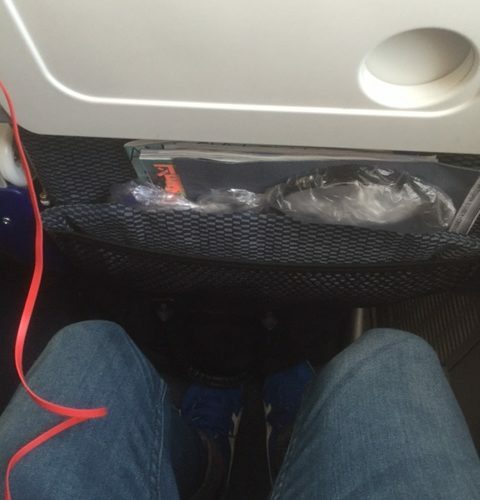 I an 6ft tall and I was seated with a equally tall gentleman and we both struggled with the legroom. 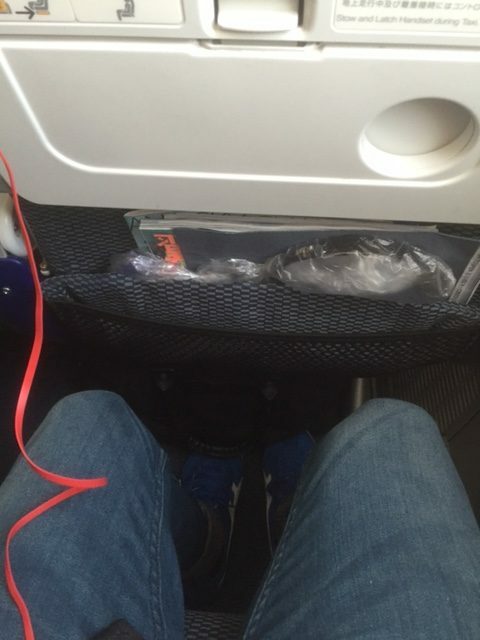 I was lucky as I had an aisle seat and could pop my leg out on the aisle every now on them. The service on ANA was excellent. Cabin crew were very helpful and the food was delicious, but the legroom is still an issue. ANA only recently started the Boeing 787 service from Tokyo to Mumbai and I got a chance to fly this route in April 2016. The equipment used on the route is Boeing 787-8, one of the earlier delivered to ANA, probably 2011. While I was lucky to get the emergency exit seat 20K, I managed to try the other seats for legroom. The seats in the Boeing 787 have definitely more legroom than the B767, which I flew to reach Tokyo. However, the seats still did not recline much. I did not bother much as it was day flight. In flight entertainment was very good with latest movies and meals have always been excellent in ANA. Tokyo Haneda to Osaka Itami on a Boeing 767-300. 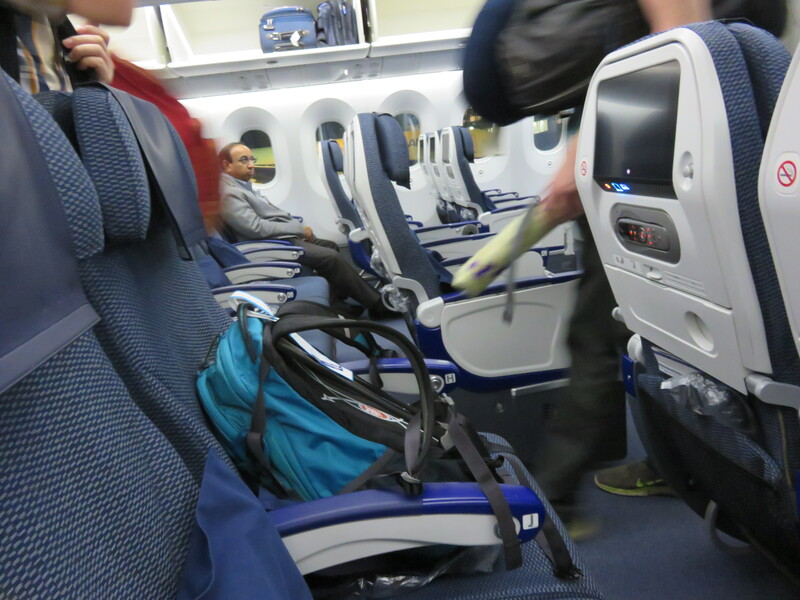 Seats was 2x3x2 and it was much more comfortable compared to the Hong Kong to Tokyo Narita. It's now easy to recline than the previous international flight. Legroom was much specious than other aircraft. But no TV screen on the flight. Width was small. Storage was huge and no power supply. Recommend these seats. Hong Kong to Tokyo Narita. The 787-8 was not new since it was made in 2011. The seats were not that comfortable, legroom was quite small and recline was so hard, because people behind me told me not to do that. TV screen was near my seat. The storage was small and my power supply didn't work. I will avoid this aircraft in the future. But other ANA service was even better. 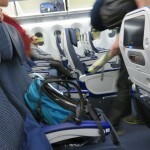 "your neck will be bent"
Had a pretty bad experience with ANA Economy Seats on a recent Boeing 777-300ER flight from Tokyo to Frankfurt. Unlike other economy seats I've experienced, the back of the seat is fixed in a way that the person behind you is not bothered by your reclined seat. When you press your recline button your cushion will move forward (slightly reducing your legroom). As a result the backrest will incline however the headrest will remain fixed and vertical, which means your neck will be bent quite uncomfortably. Not only is it hard to sleep in this position but after a 12 hrs flight you'll also have the stiffest neck you've had for along time.